When we see this scene begin in most renditions, Romeo looks up at Juliet. She back at him, as she asks, “Wherefore art thou Romeo?” as if expectantly looking for him. “Where ya at, Ro?” But if we understand that wherefore means why, then her question becomes “Why are you Romeo?” And that’s a weird question to ask a person who you’re talking to, unless you’re looking for some other pining teenage boy skulking around your window. That is, until you realize this scene is not one showcasing communication between two people, but rather two moments of soliloquy. “Solilo-what?” It’s a fancy way of saying that a person’s talking to themselves when they believe they’re alone (even if they’re not), especially in a play. Voiceovers hadn’t been invented by Shakespeare’s time. The two characters are speaking to themselves about each other, and Juliet is asking why she had to have feelings for a Montague when her family held an ancient feud with them. 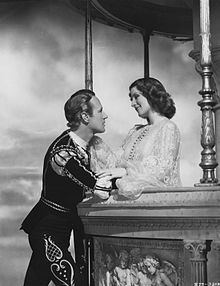 “Why did you have to be Romeo?” The understanding of “wherefore” meaning “why” forced me to see that the tradition of this moment being a communication between two lovers was wrong. It was a dual soliloquy. Two people talking to themselves. Talking about one another, not with one another. This tradition of looking at a text from the viewpoint that we want to see, causes us to miss what the author intended in its writing. It raises the question, “Does the meaning of words come from the one giving them or the one receiving them? Or is it somewhere in between?” In short, how does communication really work? The one giving the words, either by speaking or writing, has a meaning in mind that they wish to pass on to another. If the one receiving the words doesn’t come to understand this intention of the one giving the words (either because it wasn’t communicated well, or they misapplied the meaning) then it becomes what we call a miscommunication. So this tells us that the intention of the one giving the words being understood by the one receiving the words is what’s important in communication. Otherwise we’re just talking at one another, not with one another. We experience a sort of dual soliloquy even while we believe communication is happening. And this is important not just in our communication with other human beings, but with God. His word is one of the primary ways that he speaks to us. Thus, as we receive his words, we must seek what he means, not what we want it to mean. We have to be careful to not mistake dual soliloquy for communication. If God speaks and we misunderstand his words, then it’s like God is talking about us, but there’s no one really listening to him. All the while, we’re speaking words at God that have nothing to do with his intentions for us. Our interpretation must match his meaning if communication from God is to occur. The preacher told those under his care that the Spirit was upon them all. They were anointed to proclaim the gospel, the good news, to the poor. He applied those words to the people. But if you look at the context of the passage in Luke, Jesus is reading from Isaiah 61:1-2. It’s a passage about the Messiah, what his work would be. When Jesus read this in the synagogue in Luke 4, this was him pronouncing his role as Messiah. The people in that synagogue understood it, because they wanted to kill him for what they believed to be heresy when he included the Gentiles in his messianic mission. To apply those words to anyone other than Jesus is to lay claim to our own Messiahship, which truly is heresy. Yes, we are called to live and serve like Jesus. Yes, he asks us to continue his mission. Yes other verses tell us that the Spirit is within we followers of Jesus. Yes, we are to proclaim the gospel. But to apply those instances of the word “me” from Luke 4 or Isaiah 61 to anyone but Jesus is a miscommunication that could lead to generations of misunderstanding. We must be careful in how we apply the word of God into our lives. Picking a single verse, or couple of verses, that sounds like what we believe God is telling us to do, when that verse was never meant be applied that way, is a misunderstanding of God’s words. And this is true even if other places could prove the same point. Just look at those verses for the point and there’s no problem. But please do not take a verse out of its context to prove a point that the verse does not prove. One of the best tips I can give for interpreting the bible, that anyone can follow, is to always look at the surrounding verses. There’s often a flow that authors follow. Each author may have a different one, but they have a train of thought that must be taken fully to understand what is being said. Then, once the context is taken in, there can be application to the life of the individual. This may sound harsh, like I’m calling out another preacher. (Notice, I mentioned no names.) But why I want to make a big deal about this is because people can be (and have been) hurt by applying a passage of the bible in a way it was never meant to be. We can laugh when English literature is misunderstood because we don’t understand Old English words, but when a person tries to walk away from God because someone misused God’s words to make a promise he never made, and then didn’t come through on it, that is the true tragedy.